Eromancer is creating content you must be 18+ to view. Are you 18 years of age or older? 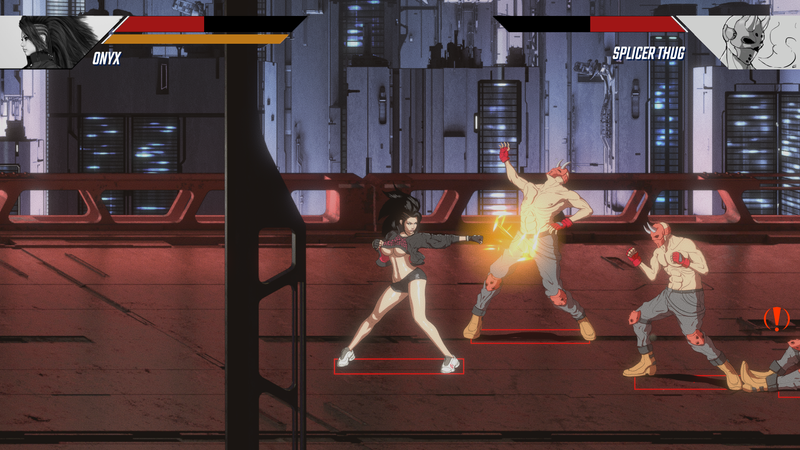 Pure Onyx is a classic beat ‘em up set in the world of our flagship title, Malise and the Machine. It follows heroine Onyx as she brawls her way through the dystopian streets of New Babylon, where she’ll encounter gangs, crime syndicates, a corrupt police force, and the bio-engineered horrors of the insidious Babel Corporation. 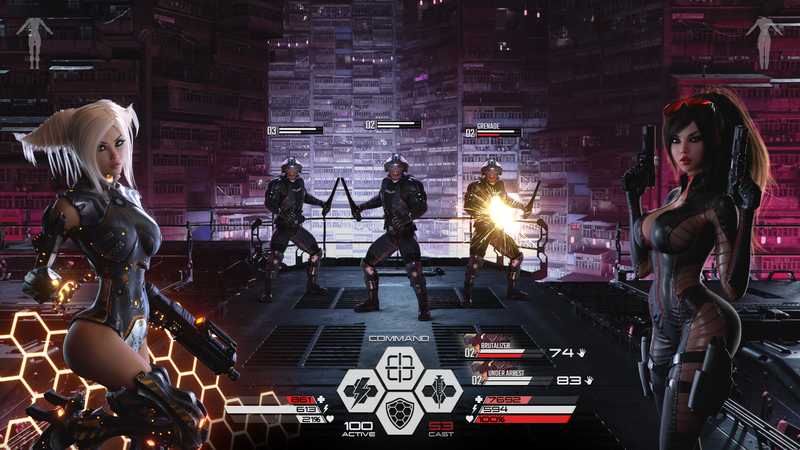 It features fully animated, hand drawn art and is styled after 80s cyberpunk anime. Pure Onyx will contain in-game, fully animated H content. 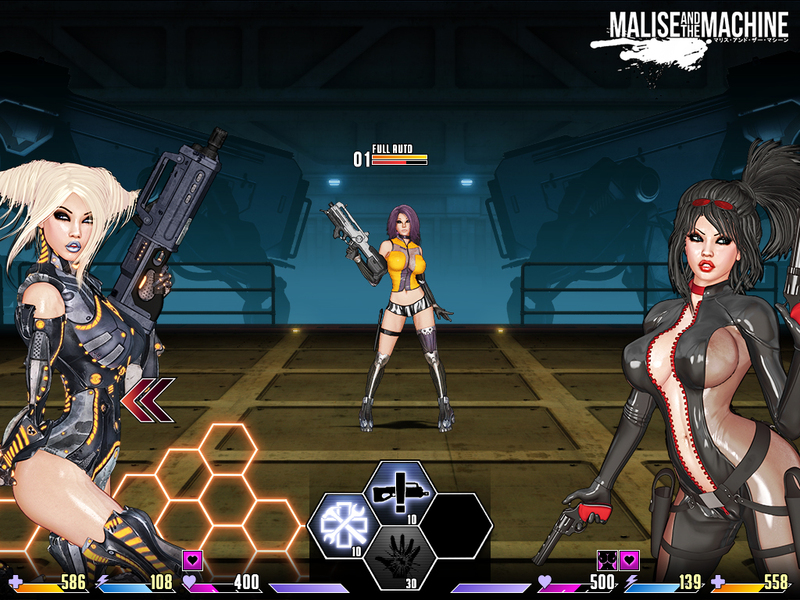 Malise and the Machine is an adult, classic JRPG with an ATB-driven battle system. It features in-battle H content, fully animated enemy sprites, and unique, highly detailed character artwork for every action. We've been hard at work on a completely new engine, artwork style, and new content. We will be intermittently releasing battle tests to the $3 and $10 tiers, which we invite you to check out as we approach the next major release! Started in late 2013 by then sole member Eromancer, the team now consists of seven developers! How does the donation process work? What do I get in return for helping out? When you make a pledge to this project, you are charged for your initial pledge, and then on a monthly basis until you choose to end your support. Pledging $3 per month will give you instant access to the project activity feed, allowing you to see and comment on updates that I post. This includes monthly in-depth progress updates with visuals and previews of what we’ve been up to! In addition, you’ll receive access the latest versions of our games! Please note that we may not have a new release ready every month as we want each build that we release to be stable and bug free, but we will do our best! Pledging $5 per month will also net you a nearly 300-page high resolution artwork PDF that gets expanded with each major release, as well as a series of artwork compilations! Pledging $10 per month will enter you into the "Inner Circle". At this tier you will receive weekly in-depth and technical progress updates via the Patreon feed, including previews of high- resolution artwork as it’s finished. In addition, every time we reach a point where we have a semi-stable build we'll share it with those who have pledged at this tier. This will give you the first opportunity to offer feedback and also help me firsthand with testing. We’ve received a lot of praise for the electronic-metal and industrial inspired soundtrack to the game, and we are now offering the latest version of the soundtrack to patrons who pledge at the $15 per month tier. Beyond that, a pledge of $40 (continental U.S.) or $50 (international outside the U.S.) will get you a high quality metallic ink artwork print delivered to your door. Check out the current print designs below (the designs will rotate as development progresses)! Keep in mind that all game and print artwork is uncensored. Just let me know if you’d like the SFW or NSFW version! Our team is entirely comprised of members who work full time on these projects and are supported almost entirely by the proceeds of this campaign. Your pledge really makes a difference for us. Here's a big thanks to everyone for taking the time to check out our project. An even bigger thanks to those of you that choose to participate and help us out as the project progresses! Let's make some games! Receive access to the latest version of the game! Get monthly in-depth progress updates via the Patreon activity feed! Receive a special high resolution artwork PDF that will be expanded upon with each major release! Join the "Inner Circle"! Receive weekly in-depth technical updates, exclusive test versions, and high resolution artwork as it is finished! As such, you'll be among the first to voice feedback and to help make suggestions for improvement! Receive the latest digital soundtrack, including bonus and promotional tracks! Receive the latest digital soundtrack, including bonus versions and promotional tracks! Have a high quality 11"x14" artwork print of your choice in metallic ink shipped to your door each time you pledge at this tier! ***Continental United States only! Please use the $50 tier reward for international orders! Choice must be made from a list of exclusive designs that will be updated as the project continues. Have a high quality 11"x14" artwork print of your choice in metallic ink shipped to your door each time you pledge at this tier! ***International (outside the U.S.) only! Please use the $40 tier reward for continental U.S. orders! Choice must be made from a list of exclusive designs that will be updated as the project continues.